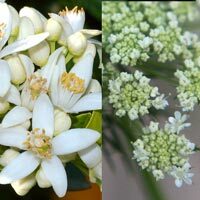 Neroli Carrot Seed – Essex County Naturals. An extra gentle, deep cleansing and purifying mask treatment featuring Tunisian Neroli and Chinese Carrot Seed CO2 essential oils that absorbs excess oil and impurities, soothes inflammation and reduces the appearance of blemishes. Leaves your skin bright, refreshed and more youthful looking. Use once a week to exfoliate, detoxify and remineralize, lift and firm, fade wrinkle lines, soften and smooth rough skin and brighten dull dry complexions. TIP: Use in combination with one of our gentle facial cleansing soaps, hydrating floral water skin tonics and beauty serums to optimize your daily skin care health regimen. Mix with enough hot water to form a smooth paste. When warm, apply to facial area while avoiding the eyes. Let dry for 10 minutes then rinse face with cool water to remove.